Whew, what a long day! But a great day despite nonstop rain and 6 hours of driving. Details tomorrow since I have over 200 pictures to go through and too relaxed after a glass of wine to do so. 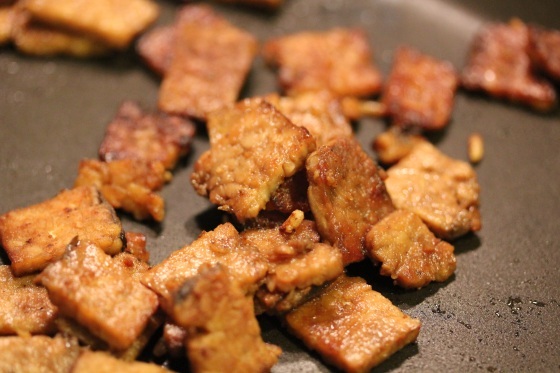 In the meantime, how about a wonderful bacon tempeh recipe? I’ve always wanted to try Lightlife’s Organic Smokey Tempeh Strips and have contemplated picking up a package on nearly every Whole Foods trip. Lack of inspiration and desire for fake bacon held me back I guess. At the same time I was thrilled to receive it and wanted to try it in a basic recipe to savor the flavor and veganize a classic. 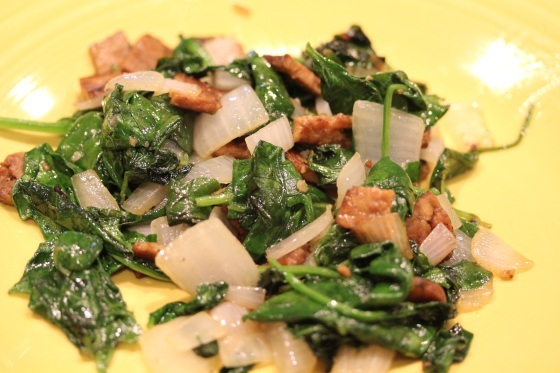 Chop tempeh strips into small squares and saute with olive oil over medium/high heat until crispy. Remove from pan and set aside. 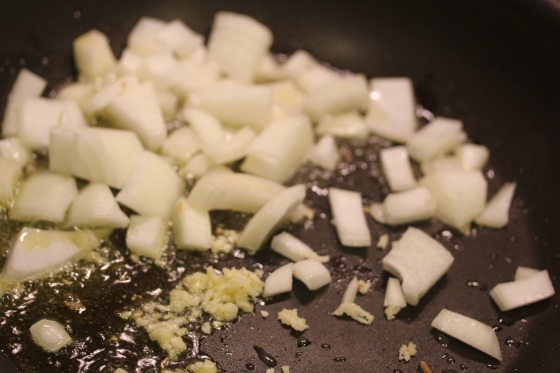 Add Earth Balance, onions and garlic to the pan and saute until onions are translucent. 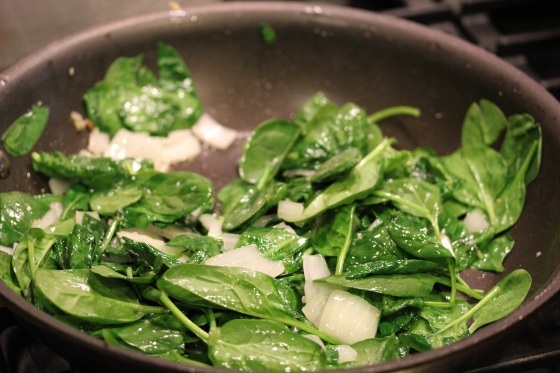 Then add spinach, salt, and pepper and saute until spinach is wilted. 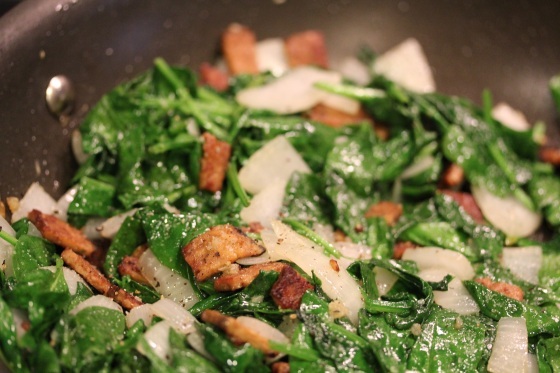 Add tempeh bacon and saute for about 5 minutes and serve. Makes 2 large or 4 small servings. The tempeh strips do look a lot like bacon and have a wonderful smokey BBQ flavor that was nicely savory, not overly sweet like some cheap BBQ sauces loaded with sugar can be. I was impressed how well the squares held together while cooking, traditional tempeh seems to crumble more for me in stir fries. Yum, the smell of onions and garlic cooking together is just wonderful. Looks a lot like bacon, huh? 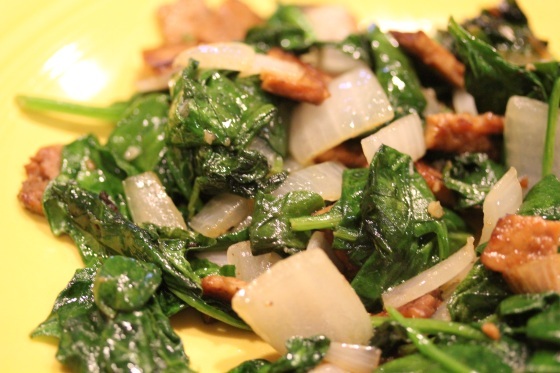 My non-vegan hubby was impressed with the strips, but said they’re not like bacon … then something about nothing can replace bacon, blah, blah… :-) But he agreed they were good on their own with the smokey sauce well saturated throughout the strips. I enjoyed the flavorful change of pace from traditional tempeh and will buy these strips again for vegan dishes we can both enjoy. 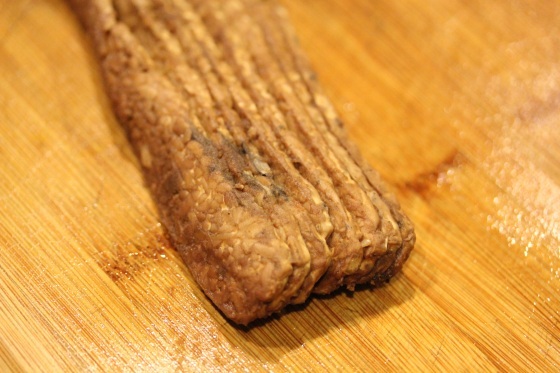 Ever tried these tempeh strips? Christine, the looks really terrific! I might have to try the tempeh bacon also. That looks good. 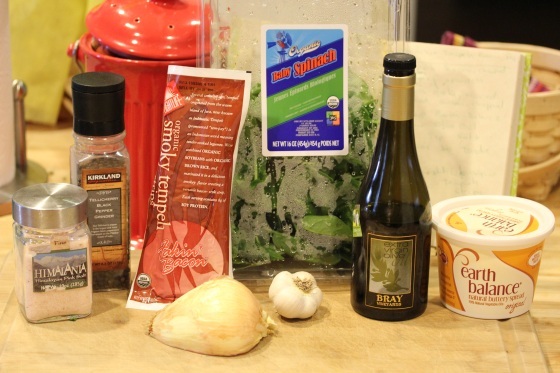 I did a tasty lentil, barley and swiss chard soup last night from epicurious.com. We were craving soup with the miserable, wet weather and I happened to have all the ingredients handy. I will have to make that again, it was great. Will make this for Thanksgiving. Great dish! Thank you! !